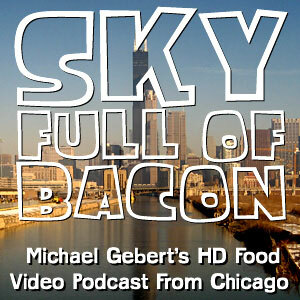 Sky Full of Bacon » Blog Archive » Subscribe at iTunes now! Having been found fully compliant with Apple’s strictures against using iTunes to produce a weapon of mass destruction, Sky Full of Bacon is now available at iTunes here. 1) It’s the most painless way to see Sky Full of Bacon in the best quality— the file may be honkin’ big, but it downloads while your computer is just sitting there, so you don’t notice. It’s just there, ready to play when you’re ready to watch. Then delete it when you’re done, completely recycling the hard drive space. It’s the green choice! 2) It helps me by giving me a measure of how many people are actually watching it. It’s much better to be able to say “I have X subscribers” than “I got X hits.” So give me a reason to keep it going by keeping the numbers up. What are you subscribing to? Jump to the most recent podcast announcement.